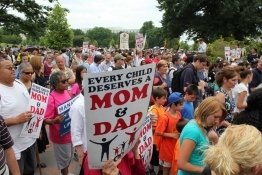 More than ever before, this year’s March for Marriage is centered on protecting God’s design for one man and one woman marriage, as well as defending the religious liberty of those who hold that conviction. The march comes at a crucial time in our nation, as several Americans have recently faced the threat of being forced to violate their consciences. It is extremely important that “We the People” stand up for traditional marriage and safeguard the liberties upon which our nation was founded. While those reasons are enough, they are not my only motivation for supporting the March for Marriage. As a Millennial, I see the culture shifting my generation in a direction with which I don’t agree. Today’s society has warped our view of long-term commitment, and I refuse to stand idly by as it manifests itself in our marriage statistics, our families, and our futures. In a summit titled, “Divorce Statistics and Social Trends,” Dr. David Ayers, Dean of Alva J. Calderwood School of Arts and Letters at Grove City College, spoke on the current marriage and divorce data for American adults. It was shocking to learn that, among the developed countries in the world, the U.S. has the highest divorce rate. That said, news sources recently declared that our nation’s divorce rate is moving in a positive direction, but is that really the truth? Yes and no. When compared to its peak in the 1970s and 1980s (thanks, in large part, to the feminist movement), the divorce rate has declined. Yet, upon closer look, the small decline is actually due to a few key elements that are skewing the data. Two of the major influences that must be factored in are the decrease in the number of people getting married and the increase in the number of couples who are cohabitating — especially Millennials. Click here to read the rest of this op-ed on The Christian Post.